Living in purpose and living on purpose (living intentionally) is something practiced in the present moment. Far too much of our attention is spent in the past or in the future. 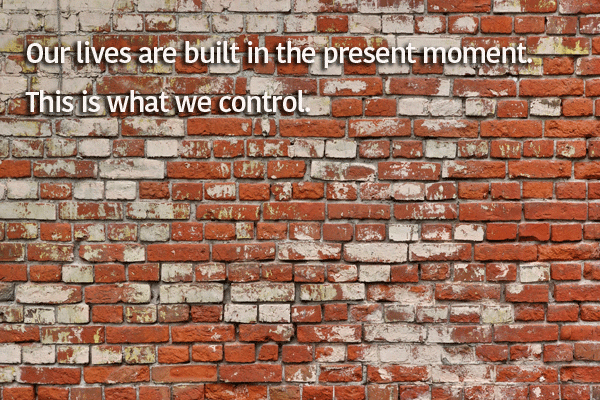 100% of our actions, however, are practiced in the present moment. Traveling through a North Carolina town several years ago I passed an old textile mill. It was made of brick. The building was huge, covering several blocks. It was the largest brick structure I had ever seen. With a little guessing and some quick calculations I estimated that there must have been a half-million bricks in just the exterior walls. At one time, before a single brick was laid, the mill only existed in the mind of the builder. At one time, maybe it’s already happened, the mill will be razed in the name of safety or progress, or because the town decides it needs a new strip mall. Then it will only exist in the minds of those who remember it. But the mill itself, the structure that housed industry and people’s livelihood, that supplied goods and fed families, that underwrote churches and schools, was built, brick by brick, in the present moment. The world existed before we entered into it. It will, with any luck, exist after we leave it. Before we were born the thought of us may have lived in the hopes and dreams of our parents. After we die our memory may live in the minds and hearts of our children and those we served. 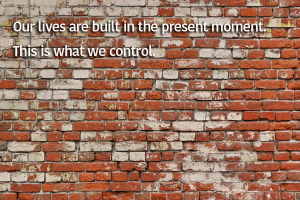 But our lives themselves are built, brick by brick, in the presents moment. This is what we control.